The use of supplementary cementitious materials (SCMs) to improve concrete performance has increased around the world in recent decades. Engineering practices demand a unified model for SCMs to predict and optimise the performance of blended concrete.DuCOM-COM3 is a multi-chemo-physical and multiscale analysis platform that can trace the whole-life behaviour and performance of reinforced concrete structures. However, the intrinsic heterogeneity and variability of SCMs present great challenges to the modelling of blended concrete. This paper first reviews the challenges and difficulties of current models of blended concrete. A multiphase modelling scheme based on DuCOM-COM3 analysis platform is introduced to consider different SCMs. Using the modelling scheme, a research road map for blended concrete modelling is introduced for future study. It is hoped that the roadmap will help to reveal the mechanism of SCM reactions and their effect on concrete performance. 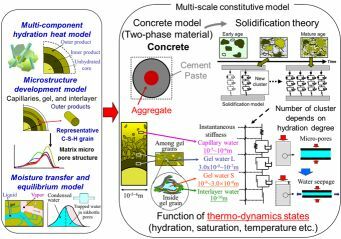 Ishida, T. and Wang, T. (2018) “Future of multiscale modelling of concrete - Toward a full integration of cement chemistry and concrete structural engineering”, RILEM Technical Letters, 3, pp. 17-24. doi: 10.21809/rilemtechlett.2018.60.